Posted on 20 December 2013, in French Fridays with Dorie and tagged carbonara, French Fridays with Dorie, michel richard, onions. Bookmark the permalink. 17 Comments. Sounds wonderful, Betsy! Wonder how it would be with spaghetti squash too. Bacon and eggs for dinner! I would like to try the classic version of this recipe as well. Ditto Tracy, and how about fennel too? Sounds like a wonderful time you had working with the Italians. I haven’t made spaghetti carbonara in a while either. 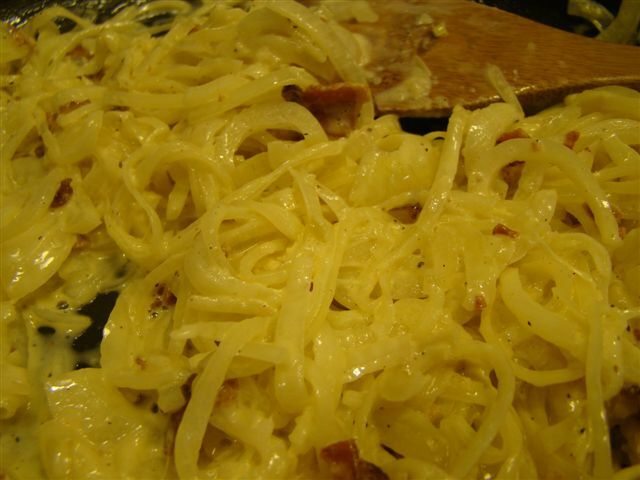 I used to make it my kids and my friend’s kids were small, because even if someone told me their kid was a picky eater I never had one snub spaghetti carbonara. I agree time to bring it back and an occasional onion version. Happy Holidays. I seem to be doing things backwards because this dish is the first time I’ve ever made carbonara at home. I had no idea it was so darn easy. I definitely need to try the classic version soon. I think I’d have loved working with your social IT team. I liked this dish as a side, but it won’t be a regular because of the cream and butter. Betsy, this was a wonderfully written Post and so interesting. I don’t often make pasta, just don’t want the calories, but the onion carbonara on top of the pasta was absolutely delicious so pasta suppers are back on my monthly menu plan also. It sounds like your work life for the Italian company was fun as well as work – almost like an international exchange program. I hope you and Howard have a wonderful Christmas. It’s been a fun year working with you. For some reason, I often seem to forget how easy yet delicious pasta dinners can be – it seems like I over complicate things in the kitchen at times. I hope that you and Howard have a very lovely Christmas. Great story and yes, this reminded me of how much I love pasta carbonara :) I liked this version a lot too and would definitely make it again! Betsy I came to love spaghetti carbonara after our youngest spent a year in England and shared a flat with two Italians. They made it often, probably because its delicious, easy and cheap and Alex loved it. When he came home he helped me recreate it and we’ve loved it ever since. He would not approve of this, however, because he hates onions! I served my onions over pasta and loved it! You make the Italian Technical People sound so fun! Merry Christmas to you and yours Betsy! Parm, butter and cream. Better with pasta. But definitely different. We were pretty happy with it – a lovely addition to our gluten-free repertoire. I saw you comment elsewhere that you used the leftovers in a frittata – that sounds delicious! I hope you and Howard have a very Merry Christmas! We enjoyed this over pasta, but i agree, my main thought was “I need to make spaghetti carbonara more often.” Hope you’re enjoying the holidays! Love your story! I thought this was pretty yummy – though I did have it with a bit of pasta – just well, because!